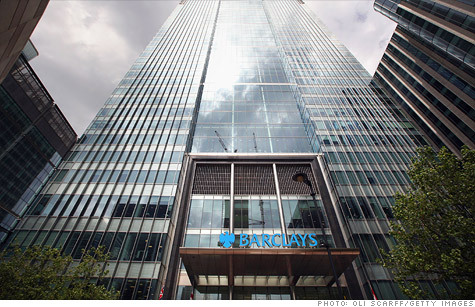 Barclays agreed to pay $453 million to regulators. NEW YORK (CNNMoney) -- Banks implicated in the Libor-fixing scandal will likely take billions more in losses as a result of pending litigation and regulatory penalties, according to industry analysts at Morgan Stanley. The analysis -- which the authors admit is crude -- is based in part on the experience of Barclays, the British bank which admitted that its staffers attempted to manipulate the London Interbank Offered Rate. Many of the world's major banks, including Deutsche Bank (DB), Royal Bank of Scotland (RBS), Credit Suisse (CS), Citigroup (C, Fortune 500), UBS (UBS) and JPMorgan Chase (JPM, Fortune 500) have disclosed that they are being investigated. Barclays has agreed to pay $453 million to U.S. and U.K. regulators, a settlement which provided the basis for Morgan Stanley's calculation that at least ten additional banks could be fined between $420 and $651 million by regulators. Other banks implicated in the scandal -- but not included in the Morgan Stanley analysis -- could also face penalties. Banks that have not yet settled with regulators will likely pay a premium, as Barclays received preferential treatment from regulators because it was cooperative and settled quickly. The other banks, according to the analysis, should expect to pay 30% more. Under another scenario, the banks could face even higher fines after the U.K. Serious Fraud Office completes its investigation. Banks also face significant losses resulting from litigation. Sixteen firms already face legal action, which Morgan Stanley estimated could result in total losses of $6 billion. Of the banks analyzed, one would face an estimated loss of $59 million from litigation, while two others would face losses of over $1 billion, underscoring the wide range of potential outcomes. The Morgan Stanley analysts freely acknowledge the limitations of their estimates, which they say are "the result of significant assumptions." The analysis, for example, assumes the banks acted to suppress the Libor rate every day over a four-year period. And the chance of a lawsuit succeeding -- estimated to be 36% -- is pegged to a study of completed financial crisis lawsuits. Other analysts are downplaying the scandal's likely impact. Glenn Schorr, an analyst at Nomura, said in a note of his own on Friday that "there are a handful of reasons that the ultimate financial exposure could be less than worst fears." Many individuals and corporations likely benefited from Libor-fixing, Schorr argued, and the system is so complex that joint manipulation will be hard to prove and losses difficult to quantify. Nomura made an effort to estimate the industry's total exposure to the Libor scandal, but found too many variables. Depending on the assumptions made, losses could range from a few billion dollars to hundreds of billions, Nomura said. "We think that given the complexity involved with this type of case, that the parties (including the regulators) may be persuaded at some point to pursue the settlement route," Schorr wrote. Correction: An earlier version of this story indicated that losses from litigation could range from $59 billion to over $1 billion, according to Morgan Stanley's analysis. In fact, the range of possible outcomes is $59 million to over $1 billion.